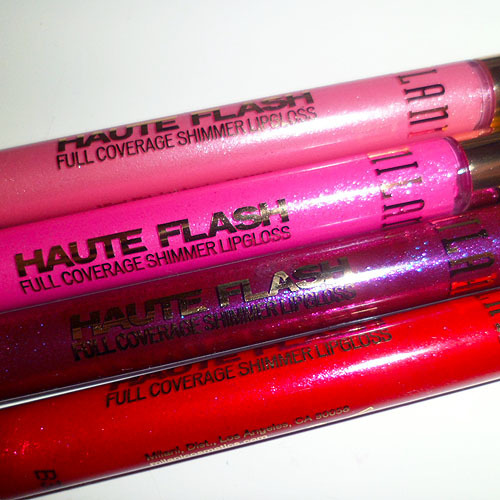 I might be a little late to the Haute Flash game, but I found out not too long ago that Milani has come up with a line of full coverage Shimmery Glosses which remind me suspiciously of MAC and Lime Crime ones. Of course, I was curious if a drugstore brand could really match up to the higih-end ones, so here's the run-down. Medium-thickness, like a Plushglass, but a lot less sticky. Not as thick as Lime Crime Carousel Glosses, and only moderately buildable in coverage. Slight minty tingle on the lips, which is quite pleasant and inoffensive even if you dislike minty feeling products. If MAC Dazzleglasses are a 3 and Lime Crime Carousels an 8, these are about 6. I wouldn't say they are really full-coverage, but you definitely get pretty good color payoff. All lip swatches shown above were done with just gloss over bare lips, without base or liner. I really like the flat doe-foot paddle. The wide surface picks up more product than the typical doe-foot applicator shape, and allows you to apply a thicker layer of product without sacrificing control. These wear like the typical gloss. They aren't sticky, which is a plus for those who hate a gummy texture on the lips, but this also means it does not stay on as long as stickier glosses do. I'd say you can go 3-4 hours without touch-ups. It also goes on fairly evenly and does not gunk up in the center of your lips or in cracks. The colors are really pretty of course. My favorite shade is 102 Flashy, the hot pink, but then this particular gloss also has the poorest texture out of the 3, as it is slightly gritty and lumpy (see swatch image above), and is bright enough to be noticeable when it shifts out of place. The one I reach for most is Quick Flash because it's so pretty and wearable for everyone. My least-favorite shade is 103 In a Flash, because it's a deep prune-purple which does not wear as evenly as the other shades, although it does make a pretty statement. You will need to apply a thick layer and keep touching up to keep it looking its best. If you like really strong color, these are probably not going to have enough of a kick for you. If you want more color than regular glosses but don't want anything too high-maintenance or dramatic, then you should try these. These are not particularly glossy, even though they are called lip glosses. The texture is more like that of Revlon Lip Butters or MAC Sheen Supremes in fluid form, so while the colors are pretty, you're not going to get dramatic shine. These are not full-coverage or opaque, despite the name. If can't bear to shell out for MAC Sheen Supreme lipsticks but find Revlon Lip Butter shades a little too "tame" for you, these combine the good points of both, as they are closer in texture to these than an actual gloss. Hi Steffi, you can always get it from beautyjoint.com where it's sometimes cheaper than retail. Plus, you get a 5% discount when you enter MAKEUPBOX in the coupon box!